Octavia came to Miami from Fort Lauderdale's Nova High School where she averaged 28 points and 15 rebounds and garnered First Team All-State honors and was named Broward County Player of the Year by The Miami Herald and the Sun-Sentinel. Once at UM, she became one of coach Ferne Labati's most consistent players, averaging in double figures all four seasons. An explosive, athletic player with the ability to score at will, she would become only the 3rd player in school history to record 1,700 points and 600 rebounds in her career. Her 1,724 points still ranks 5th all-time. In her Senior season, she led Miami to the 1998 NCAA Tournament, averaging 19.2 points and 5.7 rebounds, and shooting a school record 45 % from 3-point range, earning her First Team All-Big East honors, as well as 3rd Team All-American by the Women's Basketball News service and Honorable Mention All American by Kodak/WBCA. She was named Tournament MVP of the U.M. Holiday Classic, twice All-Big East 3rd Team, 4 times Big East Player of the Week, and First Team All-Big East Freshman Team. She played as member of the South Squad at the 1997 USA Olympic Festival. For her career, she averaged 15.8 points and 6.2 rebounds, is 4th in career field goal attempts, 5th in career field goal made, 6th in career free throws made, 8th in career scoring average, 8th in career games started, and 9th in career rebounds. She scored 40 points vs. Florida Atlantic in November, 1997, tied for the 4th best all-time. She graduated with a degree in Sociology/Sports Management. Selected by the L.A. Sparks in the 2nd round (15th overall) of the 1998 WNBA draft, she also played professionally for the Houston Comets and in Turkey, France and Greece. She is currently an assistant coach at St. Thomas University for U.M. Hall of Fame member, head coach Robin Harmony. 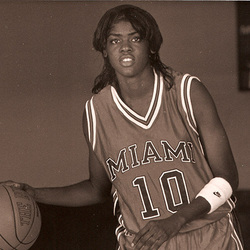 Octavia was named a "Miami and ACC Basketball Legend" by the conference and will be honored at the 2008 ACC Tournament.